There is a rule—unspoken but self-apparent—about opening the review of a book by mentioning another review of the same book, but Molotov’s Magic Lantern demands that the rule be broken. Shortly after Rachel Polonsky’s book appeared in her native England, a vicious review was posted on Amazon.com by “Historian,” who gave Polonsky’s effort a blistering assessment: “This is the sort of book that makes you wonder why it was ever written ... Polonsky, it turns out, is not an academic, as claimed in the blurb, but the wife of a foreign lawyer.” I especially love the “foreign lawyer” bit, which reeks not-all-that-faintly of xenophobia. At least the secret accuser didn’t charge Polonsky with speculating on Western currency—a favorite Soviet-era crime. Through a little digital sleuthing, Polonsky was able to trace this underhanded blow to Orlando Figes, a British historian of the Soviet Union, whose recent Natasha’s Dance (no surprise here) covered the Slavophilic cultural terrain that Polonsky—with her foreign husband, no less!—decided to intrude upon. Even in a British media notorious for its toxic reviews (recall Tibor Fischer complaining that reading Martin Amis’s Yellow Dog was “like your favourite uncle being caught in a school playground, masturbating”), Figes’s slighting of an eager young scholar was seen as a flagrant offense. He blamed his wife for the Polonsky review before eventually fessing up. He has since been pleasingly consigned to the Siberia of British public opinion. And no, the charges Figes so shamefully leveled against Polonsky’s book have not any merit. It is true that Molotov’s Magic Lantern is an unusual book, one that might be about the history of collective farming on one page and about the poet Anna Akhmatova’s Italian honeymoon on the next. It is, at heart, a book about books—and, more specifically, about the Russian books that Polonsky so obviously loves and knows so much about, and the fecund Russian soil that the authors of those books mostly loved but sometimes loathed, and, lastly, the blood that has been spilled on that earth by men for whom the power of ideas triumphed over the impermanent domain of flesh. Among the prime butchers of Russian history—and the ignominious category is a vast one—was Vyacheslav Molotov, who was one of Stalin’s closest henchmen throughout the Great Terror of the 1930s and served as the Soviet Union’s foreign minister during World War II and beyond. Notably, he was one of Stalin’s few close allies to survive both the madman’s paranoia and the Kremlin house-cleaning that followed, courtesy of Khrushchev. In fact, Molotov lived into old age, dying in Moscow in 1986. For much of his adult life, he occupied sumptuous quarters in the middle of Moscow, at 3 Romanov Lane—a comfortable apartment building where the Soviet elite blithely enjoyed capitalist comforts while the proletariat carried out the class struggle on the streets below. Polonsky happened to move into the same building with her husband in the post-Soviet era and quickly came to realize the significance of her new domicile, which native Muscovites apparently still call “the House of Generals” or “the Party Archive” for all the members of the nomenklatura who once lived there. One of them—the apostate Trotsky—was dragged from it by the NKVD during an arrest. But none, perhaps, was as notorious as Molotov, who lived in the apartment directly above Polonsky’s. Churchill once called him “a man of outstanding ability and cold-blooded ruthlessness,” but he was also a lover of literature, as Polonsky discovers when the apartment’s owner, a banker, allows her a visit to Molotov’s “rich and civilized eclectica of books,” some of which he pilfered from the Lenin Library. Despite the “residues of a malign force” that Polonsky feels amidst Molotov’s books, she finds among them signs of surprising humanity: for example, “a torn-off bookmark bearing the single word: ‘borscht.’” She sets out to learn more about the man—not by researching him, but by researching the books he owns, working on the somewhat old-fashioned supposition that one’s character can be gleaned from the books one possesses (today, depressingly, this would be done through Facebook). Roam she does. Not only through the books in Molotov’s library, but through the indescribably vast country itself, teasing out the intersections of literature and history that crisscross Russia as finely as etchings on hardening clay. After a while, the initial impetus of discovering Molotov’s personal history is quite simply discarded. 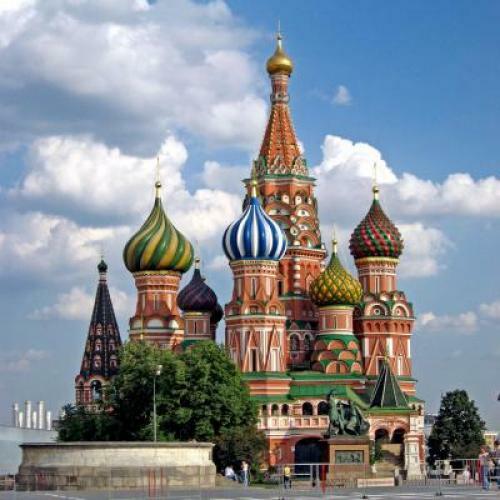 Polonsky is especially fine in her descriptions of Moscow, where much of the book takes place. She writes that “to learn to love Moscow is ... to become familiar with a certain kind of grief, for it is not a city whose authorities are much given to its conservation. Moscow advances architecturally in sudden rushes of new prosperity or state ideology after bursts of frenzied destruction, from without or within,” which seems to me a fine description of the country itself. And as she ventures ever deeper into the land, she approaches the post-Soviet landscape with what can only be described as good cheer—specifically, the good cheer, touched with just a measure of naïveté, that the British, despite everything, seem to have retained from their Grand Tour days. In desolate Murmansk, the days of nuclear submarines long faded, she writes of the Naval Museum: “Regional museums in provincial Russian cities are not arranged for occasional foreign visitors so much as for the pallid teenagers who are always shuffling in sullen groups one hall ahead of you.” This, too, is symptomatic of some larger truth about Mother Russia. Literature is everywhere, and Polonsky has a keen understanding that while Russians may not read much any longer, books remain a crucial aspect of the national character. Standing on the flattened plains of Taganrog, she says of Chekhov, who once lived there: “He learned about the horizon of time from looking into the lilac steppe distance.” Polonsky may not be an academic, as Figes acidly suggested, but she certainly understands what books mean to the Russian people. If this unusual narrative has a fault, it is that Polonsky’s prancing can break out into a gallop a little too often; and as she wanders from Moscow to the steppes of Central Asia to the godforsaken Far East, it is sometimes hard to recall what exactly holds this narrative together—basic human curiosity, I suppose, which sometimes seems in such short supply. Still, a little more of what I used to call a “controlling idea” in my teaching days would have served Polonsky well. And then there is the occasional phrase—“Soviet redolence of tomcat pheromones”—that should have been stricken by her or her editor. But still this is an audacious effort, one that tries to capture an entire literary legacy, and the collective tragedy of a beleaguered people, in fewer than four hundred pages. And it is, at least to my limited knowledge, the only history of Russia to use a Bob Dylan lyric as its epigraph: “I can’t feel you anymore, I can’t even touch the books you’ve read.” I imagine that Figes was, at bottom, stung by the thought that Polonsky had written a book more clever and current than his: there she was, drinking Jack Daniels at 3 Romanov while he poured over Stalin’s archives. And so he went online, and at a time when people are reading less, tried to turn away a potential audience away from a book that is worth their attention. Molotov would have been proud. Alexander Nazaryan is on the editorial board of the New York Daily News. He is at work on his first novel.